I’ve been following Botnek ever since I heard their remix of ‘Animals’ which was one of my favorite remixes of the ridiculously overplayed track. In fact, we here at MMIBTY even did a write-up on Botnek’s remix of that track. 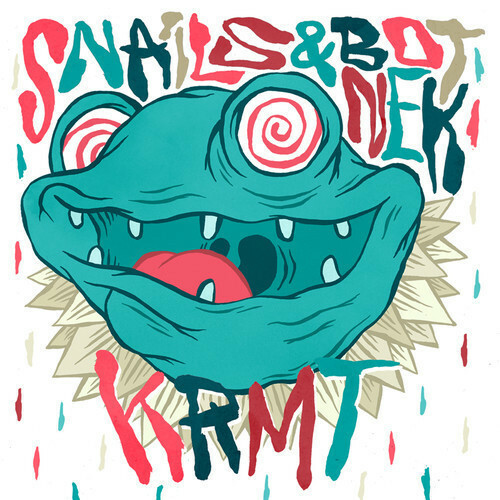 Anyway, the other day I saw Botnek and SNAILS did a song together called ‘KRMT.’ I listened to ‘KRMT’ and instantly fell in love with it the first time listening to it. ‘KRMT’ is an electro-house track, and this is one of the best electro-house bangers I’ve heard in the past few months. I’m not exactly sure how to explain the drop except for it was amazing and mind-blowing. The drop had such a unique sound, and I love the synths used to make it. I can’t think of any track that even sounds like ‘KRMT’ because it’s just super unique. It’s really refreshing to hear some special and totally original electro-house; so many tracks on the Beatport Electro-House charts sound so similar especially when it comes to the drops. ‘KRMT’ also has an awesome beat that doesn’t quit, and the song overall just packs an awesome in your face electro-house punch. SNAILS & Botnek destroyed and nailed this track, and I hope that I will hear it in more sets in the future. The track has already gotten tons of support from Thissongissick.com, and it’s sure to only keep getting more and more support. After listening to the track non-stop for the last day and a half I figured I should check out more of SNAILS’ music because I had listened to a ton of Botnek’s music before. Listening to his music I found that SNAILS has a really unique sound, and I ended up downloading almost all of the free tracks on his Soundcloud. I have a feeling that with this type of talent, we will definitely be hearing much more about SNAILS & Botnek in the future which is exciting. However, there’s no time like the present so if you love electro-house then ‘KRMT’ by SNAILS & Botnek should listen to it now. Also the two artists are awesome enough to give it away as a free download which is always a nice treat. Enjoy!